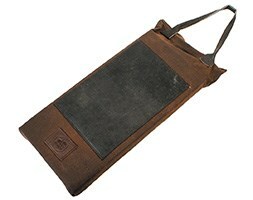 This kneeler has been made in England from high quality traditional leather and suede. This quality makes it both tough and protective to the knees when gardening for long periods of time. 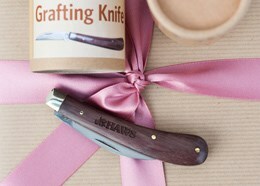 As well as hard-wearing it comes in a stylish design which makes it a great gift for the gardener in your life. 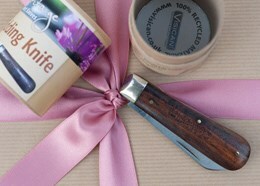 These knives are a handy gift for gardeners that love to keep their tools on them at all times. They are hand made in England from high quality traditional carbon steel which makes them great for cutting strength and sharpness. Measurements: Blade length: 8cm Handle length: 10cm Dry blade after use and keep well oiled. Use a high quality sharpening steel to keep blade sharp. Weight These are very light. Therefore they are easy to move around. Especially with large pots this is a huge convenience! You will have the opportunity to change the view of your terrace or balcony in an easy manner regularly by placing your pots elsewhere. Measurements: Small – Depth 33cm, 27L capacity. Large – Depth 58cm, 80L capacity. Waterproof This is a very great advantage that will make your plant very happy indeed. Because synthetic flower pots are not porous, bacteria do not get the opportunity and additionally the soil dries out less rapidly due to evaporation or leaking of the water. Thus also clearly better for the health of your plants. If you use the pots indoors it also mean that you will not run the risk of getting stains on the floor, table or window sill as a result of leaking water. Frost proof You can easily leave your synthetic pots outdoors in the winter. Up to a temperature of 20 degrees Celsius below zero synthetics are frost proof. Handy if, for instance, you want to plant flower bulbs in flower boxes in autumn. But you can also create atmosphere on your terrace with an evergreen. . With synthetic pots you can therefore give your terrace a green face even in the winter! Durability Synthetic is a very strong and sturdy material. Pots that are made of synthetics do not break due to a little bump. There are no little pieces that break off. Convenient with children! Additionally this pot is UV proof, so they do not loose their colour under the influence of sunlight and that is a very appealing certainty. 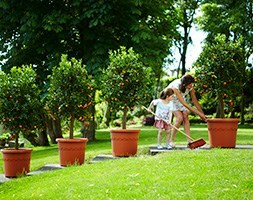 Maintenance friendly Synthetic pots are very easily cleaned. Because of the smooth surface (and the fact that they are not porous!) algae deposits for instance do not get much of a chance. 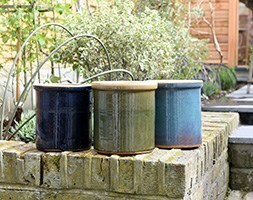 A cloth, a hand wipe or a brush over the pot is usually sufficient to make the pots look like new again. Available in more than one colour and size. All colours and sizes sold separately.